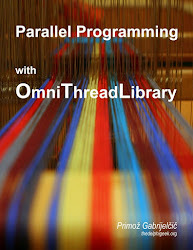 After a long wait, Programación Paralela con OmniThreadLibrary has been synchronized with the english version of the book. The book has now 209 pages and is considered to be 60% complete. This two part webinar will focus on high-level abstractions (Await, Future, ParallelTask, ForEach, Pipeline etc). In addition to the in-depth presentation of all eight high-level abstractions, the webinar will explore the blocking collection, a queue class extensively used in many high-level abstractions. This webinar will focus on "backend" classes in the OTL - queues, locking primitives, TOmniValue record etc. All of these can be use in any application, single-threaded or multithreaded, TThread- or OTL-based to simplify programming and improve your productivity. This webinar will present best practices for the multithreaded programming. In addition to the abstract talk, it will contain numerous code examples to prove the point. All of the webinars will be split into 45 minute presentation followed by the 15 minute Q&A part. To help me determine the best time for webinars and to assess the interest, I have put together a small survey. If you are interested in participating in a webinar or downloading it for your personal use, please fill out the survey. There are only seven questions, none of them mandatory. All participants of the survey that will leave an email address will be entered into a draw to win a prize – a free copy of the OmniThreadLibrary book! After you have designed and written some code, you should always test it. This is especially important for the multithreaded code which rarely works on the first (or the second, or third) try. After explaining the design, I’ll continue my trip into the depths of the lock manager by exploring the actual code. Let’s take a look at the public parts first. I was thinking about the problem and it turned out not to be a simple one. Yes, I could solve it by introducing a string-keyed dictionary of critical sections but that would be a little bit too limiting for my taste. I had some other requirements in mind which further complicated the implementation. TL;DR – This lock manager is implemented in the OmniThreadLibrary as IOmniLockManager<K>/TOmniLockManager<K> in the OtlSync unit since revision 1268.